Pete is a divorcee and a tour guide at a popular hotel that happens to have a military bunker underneath it. When the plague known as Hamelin's Revenge hit and zombies began to attack, Pete and at least twenty other people took shelter in the underground bunker. There's just one little problem: the bunker is no longer in operation and food stores are almost non-existent. With hunger soon turning into starvation, Pete and his fellow survivors learn that there may indeed be things worse than the zombies waiting patiently on the outside. 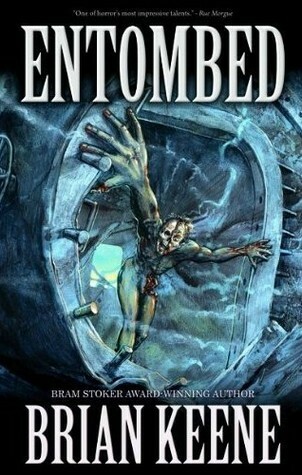 Taking place in the same world as Keene's novel Dead Sea, Entombed is a novel that is a sequel novel that really isn't a sequel at all. So you don't have to enjoy Dead Sea (as I'm sure you will if you are a fan of the zombie genre) in order to enjoy Entombed, but I'm that weird kind of person that has to read sequels after I read the originals first even if the sequels aren't direct sequels. Naturally, I would insist other people do the same, too. Both Dead Sea and Entombed feature zombies that are different from the zombies in Mr. Keene's The Rising and City of the Dead. The zombies in the former are your traditional Romero type zombies while the zombies in the latter are intelligent and sentient beings. Clocking in at only 134 pages on the Deadite Press edition, Entombed is a very short read. I wouldn't really call it a novel. But I like the story. It's simple and really doesn't feature zombies all that much, but it mostly works. Just don't go into this book expecting it to be Dead Sea Part II. I also think that calling this book a zombie book is a bit of a misnomer. It's more like psychological horror with a few zombies roaming around. Still enjoyable no matter what you call it, though. "Psychological zombie horror" sounds like a good genre name to me. As soon as I finish the book I'm working on now, I'm going to get me a Keene. This Heat winning streak is keeping me from reading much because I've been watching every game on this streak.